If you haven’t heard about the Aussie team’s capitulation in Cape Town over the weekend, then you might be hiding under a rock. Though they lost, they lost with grit and with character, and their coach was able to praise them for having a go… in previous years they’d have simply folded under the pressure and the opposition would’ve mounted a cricket score against them. They had no backbone. No go-forward. No character. In previous years the team’s reputation relied on a couple of superstars who it seemed believed they transcended the game — they thought, it seemed, that they could behave with impunity, that they could get away with anything on and off the field, so long as their performances occasionally justified the massive dollars thrown their way… but those superstars have been shunted in the name of ‘cultural change’ — an attempt to play the game ‘hard but fair,’ and a coach firmly committed to a famous Aussie ‘no dickhead policy’, and the nurturing and development of backbone, grit, and character. Because character counts. By now it’s clear I’m not talking about that other Aussie team who capitulated in Cape Town. There were two sporting contests pitting the best of Australia against the best of South Africa in Cape Town over the weekend. One involved a ‘national disgrace’ and displayed the cost of a winner-takes-all approach to sport, that in many ways is emblematic of an Australian ideology, the other displayed the counter-culture that perhaps should regain the ascendency in the Australian psyche. While the Aussie Cricket team got down and dirty, using ‘grit’ to take the shine off both the ball and our reputation, the Queensland Reds, a rugby team who until this year were the epitome of flakiness won praise for going toe-to-toe with a vastly superior (and more experienced) Stormers, even though they lost 25-19. The two teams, and their culture, are interesting pictures of what sport can be, and what it represents, and in some ways they’re a picture of a contest to define the Australian soul; our psyche… and it’s on us, the populace, to help define what we’re on about as a nation, and what sporting teams (and cultures) truly represent us. We get the sporting superstars we deserve; because we get what we celebrate… and what we celebrate, in a cyclical way, comes back to shape who we are. And this is a vicious cycle. It can literally, if we aren’t careful, be a cycle of vice. For a long time the Queensland Reds were terrible representatives. Not only were they terrible on the field, they were led by enfant terribles Quade Cooper, and Karmichael Hunt. Cooper, whose early off field misdemeanours included charges for breaking and entering while on sleeping pills, and Hunt, a ‘three-code superstar’ whose on-field talent saw many prepared to turn a blind eye to his off field proclivity for party drugs and partying. But not this year. Not in this team culture. Not under this coach. The new Reds coach, who has surprised many with both his approach to team culture — and these two superstars — and with how he has, in a short time, started stamping something of himself into this outfit. Now, disclosure, I’ve had the privilege of being part of a church with Brad, and having him stamp some of that character into me (not on the sports field, but there was a time when he took it on himself to train me and give me some vision for masculinity that came at a particularly formative time — which involved long runs, hard chats, and spewing up after gym sessions), but I have no particular insight outside knowing his character and reading his comments, into how he is approaching his job as coach. I’m totally unsurprised that it turns out the man can coach, and I’m not surprised by his response to his team’s gritty loss over the weekend (it was a performance unironically described as gritty in a match review that happened pretty much next door to the controversial cricket test at the same time). Can you imagine an Aussie cricket coach or captain describing a loss in those terms? Not in recent years. I can’t remember the last time an Aussie cricket team displayed non-literal grit. Defence (and so character) was the reason Brad gave for Cooper dropping to club rugby. Because character is everything. It’s bigger than winning — but it’s pretty clear that for Brad winning flows from character (and he is, from first hand experience, remarkably competitive, even at chess, table tennis, and Golden Eye on the Nintendo 64). It’s no surprise to read story after story about how Brad leads by example — how he’s still putting up gym numbers that inspire his charges, and leading the weights session after a win to keep his team humble. The Australian cricket team — needs a culture change — especially if they play an important role in modelling the Australian character back to Australians and so reinforcing it, modelling it, developing it… and character change is possible through leadership, modelling, and the will. They need someone like Brad to stamp themselves — their character — on this team. 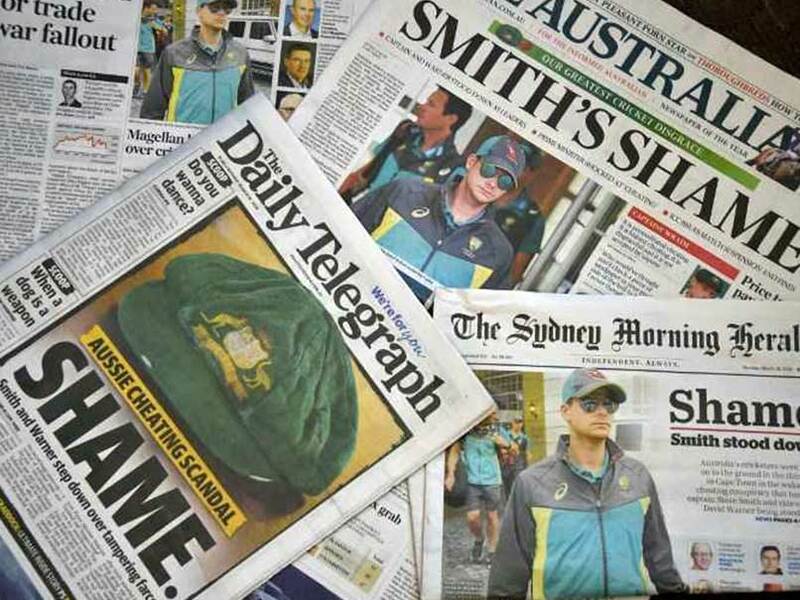 But the jump to condemn the Aussie team, and to demand their heads — and Smith’s weird apology, which felt like an apology for being caught — reveal some things about a deep issue in the Aussie psyche. It’s not just the national team that needs a culture change — and maybe a sweep through with the broom, from the top of the administration through to the players on the field… or at least a thorough recalibration of our metrics and our culture. It’s all of us. Character is stamped upon you by repeated actions — but it is also revealed in our actions. The character flaws revealed in the ball tampering episode reflect poorly on Australia because they hold a mirror up to an Australian culture that makes winning more important than character. We allow all sorts of on field practices (and all sorts of people on field) because winning is so important to us; it’s our ‘virtue’ — we drop players for a dip in performance and replace them with people of questionable character, we let sledging slide, we adopt a win at all costs attitude when it comes to our metrics, and we are so slow to forgive poor performance from our ‘representative’ athletes while being quick to forgive character flaws. This is what we get — it’s not just reflective of poor team culture within the sport (as fast bowler turned commentator Brett Geeves suggests, and Fairfax columnist Malcolm Knox argues), but poor national culture. The actions of a team reveal the character forged in a team by its repeated practices, and those practices are shaped by what the team prizes, and what the team prizes is shaped by those they represent. Now, there’s certainly a sense that these players only represent themselves, but I’m not so sure. I think they prize what we prize, and maybe Smith’s apology for being caught is on the money. It is bizarre to me how quickly we’ve jumped to judge, jury, and would-be executioner on social media — calling for the heads of those involved — without questioning our own culpability, and our own buy-in to the idea that results are more important than character; that winning is everything. How many of us, away from high definition cameras capturing our every move, are creating competitive advantages by cutting corners or breaking rules? How many of us look to examples or champions based on the results they produce not the lives they live and the character they display? How many of us put results above grit in our own metrics? How many of us celebrate a team because of its results rather than its ethos? How many of us want to split, for example, the moral lives of our politicians from the results they deliver for us (hint, see Joyce and Trump)? Our cricket team, like our nation, prizes winning above virtue; performance above character… it has put the cart before the horse, and until we re-align our priorities as a nation, and they re-align their priorities as a team, we’ll get what we saw in Cape Town over the weekend. The solution wasn’t far away, you just had to look in the stadium next door at a bloke who takes his marching orders from someone who defined character and grit differently. Brad Thorn, the coach, who gets his game plan from Jesus, the king. Here’s an interview (with my old man) where Brad shares how his values come from somebody who redefines the win, who was big on character, and who models exemplary true grit by shouldering a cross and marching towards a victory built from character. The game they play in heaven?